I think the post’s popularity points to the old marketing adage, that people fear loss, more than they anticipate or welcome gain. In my case, it was never about the loss of the physical device itself. Devices, like any objects we own — cars, houses, watches, clothing, etc., etc. are not indestructible. Things happen. Items get stolen or damaged all the time. If any of us are “married” to our stuff, then our quality of life is tied solely to what we have, how much of it we have, and what condition it’s in. My intent was totally centered on the personalization of the device. Personal data stored there, and potentially accessible to prying hands. Not the device itself. So to all my readers who may have taken away any message other than protecting your personal information, my apologies for clarity. Issues of budget, affordability, how to take and use someone else’s iPad that doesn’t belong to you, etc., etc. are beyond the scope of that — or ANY article published here. That said, I want to take a moment and close out the topic with a few quick answers and random thoughts. I’ll also link to this post from the original so with hope, all Google searchers looking to use someone else’s iPad for profit or gain, will find their way here and either be discouraged outright, or continue their search somewhere else. Ouch! Yes, it shames me to say we receive a lot of searches on that phrase and similar terms. To whomever is searching these things on the net — shame on you and may you get busted! This post and it’s related post are for victims of lost and theft, not perpetrators. If you landed on this blog with such a phrase, do us all a favor and turn yourself in to your local constabulary. Technically, yes, you can use it. NO, you should NOT use it. You should be a stand up person and make every reasonable attempt to find the rightful owner. My suggestion to anyone finding an iPad or any iOS device lying around that isn’t quite yours, is to visit your local Apple Store. They have the means there of finding the rightful owner. After you’ve done that, and if they, or you, are unable to find the owner, your conscience will guide you from there. How to restore a found iPad? See above. If it’s not yours that you found, you know what to do. If it is yours, follow the standard iCloud or computer/cable instructions provided by Apple. What type of security do I have on my iPad? This was covered pretty well in the main article. There are many different levels of protection, including password (strong or 4-character), encryption, and app-level protection offered by many note-taking and mail-based applications. At the very minimum, I recommend encryption + 4 character pin + automatic data wipe after failed password attempts. Apple.com (™) has a lot of good material on this on their website. Whatever you do, be sure you have “Find My iPad” installed everywhere. Regardless of what security methods you use, you absolutely must be able to get signals from it and also send a remote wipe signal in the event of theft or loss. Lost my iPad – what can the police do? I linked to a disturbing survey in the original post. For all intents and purposes, the police may try to help, but likely cannot do much. iPads are everywhere, and if a thief is traveling around with the device turned off or in airplane mode — or already wiped it, there is little that can be done. 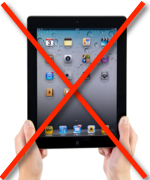 Know this: the vast majority of lost iPads, regardless of size, are NEVER RECOVERED. That was a major reason behind the original article. How to protect my iPad from airport scanners? One of my favorites! (And probably the second most common question.) Folks actually worrying more about scanning their iPads, than their bodies! In case no one else has shared this with you, IPADS WILL NOT GET DAMAGED IN AND OF THEMSELVES BY ROUTINE AIRPORT SCANNING. Really, you should worry a lot more about passing your body through one of those things, then your electronics. Personally, I’ve had my electronics (and poor body) scanned more times than I can fathom to count. Never lost any data, or picked up a strange fluorescent glow from the X-rays. Your iPad is much more likely to get dropped/damaged/stepped on/slept on/hit/nudged/stolen/”childrenized” (parents — you know what I’m talking about…) or any myriad of other maladies. Can someone access my iPad? A broad, but common question. The original article touched on this, but yes, it is technically possible (but I won’t go into specifics to protect those who have lost their iPads.) Especially if you use it without any password or pin. Any device is accessible in some way, with or without security. That’s the bad news. Multiple security measures are always necessary, coupled with a fast response the moment you realize it’s lost or stolen. The good news is, that IF you take the right precautions with your iOS devices (do it now — RIGHT NOW before leaving this article, even if reading on an iOS device…) then you can have a high degree of worry-free confidence about your personal data, if your device is ever lost. “Hotel wifi – safe for Apple (™) ID? As a general rule, an Apple ID should only ever be sent encrypted. (In fact, the identity management side of me wants to say a lot more about the increased importance of securing Apple ID’s has become in our lives. But that’s a topic for another time.) For instance the App Store (™) or other app that may need it. However, DO keep in mind that hotel, airport, coffee shop or most any public wi-fi is unencrypted. If you must use it, be sure that you browse only HTTPS websites and keep web traffic to a minimum. Gmail and other similar apps already use HTTPS, so you’re generally pretty safe with those. That said, you do want to be careful naming your iPad. It’s tempting to want to name it after yourself, your pet, your family name, place you live, or other identifying attribute. But keep I recommend that you keep it generic. Something like “dev768cpad”. The best way to get maximum security — regardless of what network you’re using (employer / travel / hotel wi-fi, etc.) — is to invest in a reliable, global VPN. There are many free and paid options available in the iTunes App Store and around the Internet. How to go about locking a lost iPad? You can’t physically lock the lost iPad once it’s out of your control. What you CAN do, is set it up so that it can be remotely wiped under certain conditions, or locally wiped if so many password attempts fail. The original article has a lot of advice on how to set this up, or respond after in the event of loss or theft. The original article covers my top suggestions. Safe travels and keep your iPad in your control at all times! Previous Post What Works for You? Next Post What Technology Should I Learn? Which Contract Should I Accept?